← Market Timing Brief for the SP500 Index, Gold and Treasury Yield Closes on 7-03-2014: Fed Chair Says Stocks Not In a Bubble. Meanwhile, Stocks Stretched, Gold On Pause and Rates Rising Again. 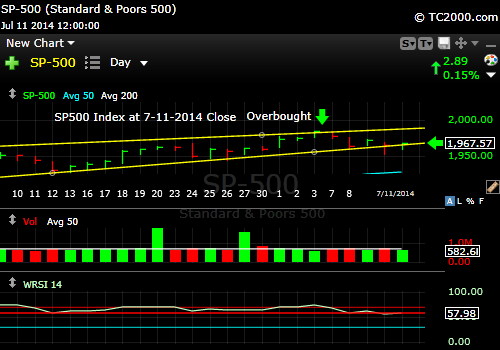 Market Timing Brief for the 7-11-2014 Close: Will Stocks Hold the Trend Line? Will Gold Just Keep Moving Up? The SP500 Index pulled back below the prior breakout above 1968.17, but it has held above the daily trend line shown the chart below. A higher low has been created. The question is whether the pullback is complete. You can also see that the pullbacks to the yellow up trend line each brought the same degree of retreat in the RSI index (Relative Strength Index). This indicates that the pullback may have been “sufficient.” But maybe not as we must look to see if this rally is a broad one that also extends to the small caps. If you look at the small caps, the picture is not as strong, and it appears that there could be another big leg down. 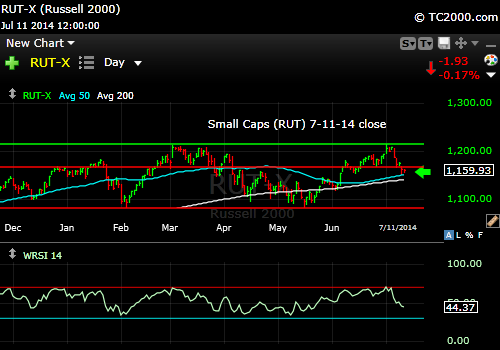 See how the RSI index has not completed it’s move to the prior lows? The Small Caps look like they have room to fall still. To get my weekly report with my current market allocations subscribe here for free: Free Subscription to My Newsletter and access to My Latest Comments/Strategy. Gold (GLD) has been making new highs as stocks have pulled back. This is a positive sign. The RSI appears to have topped out, but note that the Money Flow Index (yellow line in bottom part of the chart) has not and is making a new high. This could allow gold to keep moving higher. 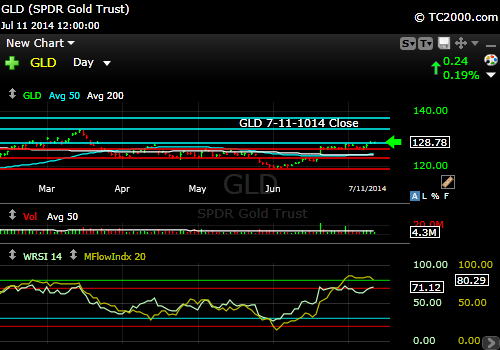 GLD has remained strong as stocks have weakened. Remember that gold often does NOT hold up if the stock market sells off hard. Investors start raising cash wherever they can find it. I don’t expect that sort of stock market sell off at this point. The 10 Year Treasury Interest rate (TNX, tracked by TLT if Bullish; TBT if Bearish) has been falling this week within the channel it’s been in , despite the strengthening belief that the Fed will raise rates in 2015. Even in the face of QE, the Fed continues to have the benefit of low rates, which is helpful to gold. The weak US Dollar is a great help to gold as well. 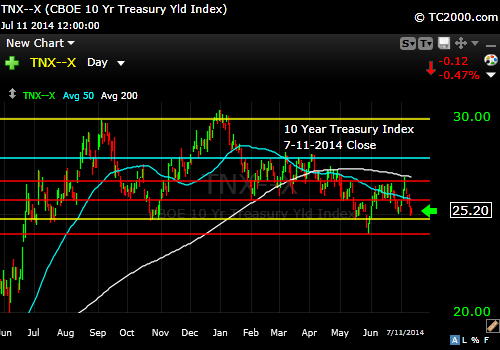 10 Year Treasury Index still tame. The Fed is winning the bond war still. CONCLUSION: Stocks could fall further, especially the small caps. Gold probably has another leg up to go (subscribe to the newsletter via the above link to find out what % we have in our gold trade now). Don’t miss out on my comments on Twitter® or StockTwits® where my buys and sells are posted. You can read my Tweets whether you have a Twitter account or not: Follow Me on Twitter®. Follow Me on StockTwits®. This entry was posted in Bonds, gold, investment, large cap stocks, S&P 500 Index, Treasuries and tagged 10 year treasury, federal reserve, gld, gold etf, market timing, sp500 index, spx, spy, tbt, tlt, tnx. Bookmark the permalink.